The latest film from distinguished documentarian Les Blank, in collaboration with co-director Gina Leibrecht, follows American tea importer David Lee Hoffman to some of the most remote regions of China in search of the world's finest teas. Hoffman is obsessed; during his youth he spent four years with Tibetan monks in Nepal, which included a friendship with the Dalai Lama, and was introduced to some of the finest of teas. Unable to find anything but insipid tea bags in the U.S., Hoffman began traveling to China, the homeland of tea. There, he struggles against language barriers and Byzantine business codes to convince the Chinese that the farmers make better tea than the factories and that their craft should be honored and preserved. This craft can not be learned from a book, but has been handed down through generations of tea makers for thousands of years. He drags the reluctant tea factory aficionados up a lush, terraced mountainside and brings them face to face with those "dirty" farmers. In an ironic twist, Hoffman reintroduces them to one of their country's oldest traditions. But Hoffman is even a step ahead of his own country in that he is advocating "fair trade" and organics. Images of the farmers standing on urban street corners selling a week's harvest for three dollars, in the shadow of China's increasing number of high rises, illustrate the paradox that stepping into the modern world imposes. Tea experts James Norwood Pratt, Gaetano Kazuo Maida, and Winnie W. Yu provide the fundamentals of tea, lending weight to Hoffman's endeavor. "Is the production and marketing of tea similar to the production and marketing of a pair of jeans? David Lee Hoffman's obsession with converting Chinese bureaucrats to an appreciation of the importance of quality and the preservation of their own cultural heritage makes for a highly compelling documentary, one that can be used successfully for classroom discussion on such issues as the seeming imperatives of globalization and modernization. As Hoffman demonstrates, quality need not be at the expense of export profits." "All In This Tea vividly reveals multiple, subtle, and complex dimensions of tea. Quirky and passionate tea connoisseur David Hoffman serves as our guide, illuminating aspects of the history, aesthetics, and labor politics of tea production in China, especially the power-laden tensions between organic, small-scale, artisanal 'boutique' tea farming and large scale, industrial, mass-production of tea...[This film] provides plenty of food (or drink) for thought and will surely stimulate classroom discussions on topics ranging from China's political-economic transformations; social and cultural patterns of consumption; diplomatic dimensions of international trade and negotiation; and the challenges facing sustainable agricultural development and organic farming." "This engaging movie takes us beyond the world of mass produced factory teas to the wonderful universe of craft teas. Viewers will savor the fascinating encounter between a Bay area food culture that goes back more than 25 years and a hidden part of the early twenty-first century Chinese economy." "In my human geography and development studies classes, students often begin to despair at the unevenness of development in the world today and the unfairness of big business and corruption. 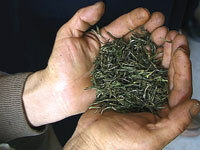 In this film, David Lee Hoffman, an ecologically aware American tea importer, provides an antidote, advocating the development of fair trade with small scale organic tea producers in rural, mountainous China. Hoffman does a great deal to raise awareness in the West about the rich tradition of tea in China. The film nicely encapsulates his efforts to both promote tea more widely and to rejuvenate the long Chinese tradition of growing high quality, artisanal tea." "Provides a view of the economic, agricultural and sociological context for the subject as well as noting the world that surrounds the aesthetic enjoyment of the taste of this beverage...I would recommend this movie for general use in any course dealing with globalization, responsible business practices and sustainable agriculture. The film is also ideal for exposing Western audiences to how Chinese tea factors into the modern export economy." "All in This Tea provides an intriguing look at agricultural and business practices in China. Highly recommended for collections with an interest in food studies, and more generally recommended for use in anthropology, studies on modern China, environmental science, and business studies." "Captivating...The award-winning documentary isn't just about the exporting of tea but also the historical and social role of tea in Chinese life and the ongoing conflict between modern tea production and processing and the traditional, organic method of tea farming that is fast disappearing...An enlightening treat." "A delicious documentary...and one that manages a harmonious blend of themes and subjects in its brisk running time...All in This Tea dips effortlessly into a half-dozen modes--travelogue, biography, nature ode, business story, nerd profile--sustaining a flexibility of tone that allows for both keen insights into the rapidly evolving Chinese economy and drunken raptures on the ability, in one especially prized blend, 'to taste the mountain.'" "Exquisite...The film is both delightful and informative at every turn...Blank, whose previous films include Burden of Dreams, which won a British Academy Award in 1982, and Leibrecht, who has collaborated with Blank for nearly 10 years, have done a masterful job of assembling this film. Of course, it brims with fascinating information about the process of growing fine tea, but the film rises to perfection as the tea becomes a kind of lens for us to consider, yet again, the fragility of our environment. It's encouraging to be told that, despite the environmental damage caused by years of chemical fertilizers, China's boutique tea industry is thriving again, and that includes the making of organic teas as well." "Les Blank, along with collaborator Gina Lebreicht, has made a film about tea, that most subtle of pleasures. It's his first film in over ten years, and it's good to see that he hasn't lost his touch. It's another beautiful, sensual film, and another homage to what makes life enjoyable...Les Blank's signature camerawork is everywhere in this film. He comes from the cinema verite style of documentary filmmaking, but his work is more reverential, less provocative than the raw 'catch them with their pants down' kind of candid camera credo that drove much of cinema verite. His camera feels like a third eye, an extension of himself, and he zooms and pans so eloquently while he films that you feel like the camera has a life of its own, like an invisible ghost who is allowed to peer more closely, to smell the tea, to contemplate the face, to go in as close as a lover could...This is what a Les Blank film gives you, a feeling that you are right there in the midst of it. He is one of cinema's true artists, and All in This Tea is another masterpiece." "An entertaining portrait of an eccentric figure whose singular passion proves infectious." "This film is a labor of love by Les Blank and Gina Leibrecht, and is a gentle, poetic film about one man's passion for tea." "Packs in more information (not to mention pleasure) per celluloid foot than just about anything you'll see this year fiction or non." "Like the drink whose virtues it describes, the documentary All in This Tea is brisk and agreeable, a handcrafted ode to the brew that is the beverage of choice where the Chinese, among many others, are concerned...The film's title comes courtesy of filmmaker Werner Herzog, the subject of an earlier Blank film called Burden of Dreams. When he drinks an elixir made from Hoffman-collected leaves, he says he imagines a lush and verdant landscape. And, he says approvingly, 'it's all in this tea.' A celestial beverage indeed." Explores sustainable agriculture and the contrast between chemical and organic farming. "Vérité yields some delightful caught moments, steeped in historical footnotes that only enhance." "The usual delight in unfamiliar tastes, traditions and personalities that has always marked Les Blank's docus is undimmed in his first digitally shot feature...Blank's usual eye for the telling or humorous detail is in evidence. Lensing and editorial contributions are spot-on; soundtrack of mostly traditional Chinese instrumentals adds yet more character." "Moving between the showy tea competitions in China and the messy work of seeking out farmers, Les Blank and Gina Leibrecht's film highlights the divide between the culture of tea and the commerce of it. Hoffman's relationship with tea is more than social; he's connected to the earth that bore the plant that sustains him--physically, emotionally, economically and spiritually. Ultimately, Hoffman becomes a kind of fallen St. George, who tried to slay the dragon of commerce but had to sacrifice his passions to survive: It's a beautiful metaphor for filmmaking and a painful comment on the price of civilization." "All told, it's a lovely work in a minor key...a valuable addition to the growing canon of slow-food films for our fast-food nation."